The Mind Lab Group was founded in 1994. Its activities are centered on the Mind Lab method, a unique approach for the development and training of thinking abilities and life skills through thinking games. The Mind Lab learning process is simple and yet extremely powerful. The process begins with students indulging in game playing, which ultimately empowers them with skills and knowledge relevant to real life situations. The Mind Lab method is the bridge that connects the World of Games with Real Life World. 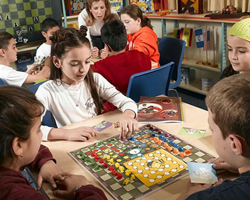 In the first stage, the children learn one of the many thinking board games in the program. They then go on to play in small groups. The instructor provides them with a game's kit and explains the instructions, goals game strategies and thinking concepts, to support them in developing their game-playing skills. In the second stage, the instructor and the students summarize the game-playing session with the help of a thinking model framework. The model should relate to cognitive processes triggered by the game playing (for example, identifying and dealing with a problem, or having to make a tough decision), or to emotional or social processes (for example, recognizing having made a mistake or having to work as part of a group). 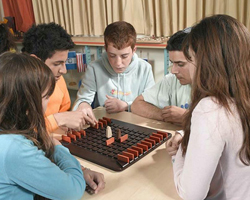 In the third stage, the instructor and students examine the game patterns and then initiate a discussion, which relates to relevant real life situations. In doing so, the students succeed in applying the knowledge derived from the game experience to their own community lives - from their studies (and also their work as adults) to enhance their emotional, social and family relationships. 1) Playing Thinking Games and learning thinking concepts and game strategies. 2) Learning Meta-Cognitive Thinking Models that describe abstract thinking processes. 3) Discussing and Analyzing Real Life Applications of the Thinking Models.